This dish is dedicated to one of my FB page readers. Thank you for inspiring me to make this combination ! 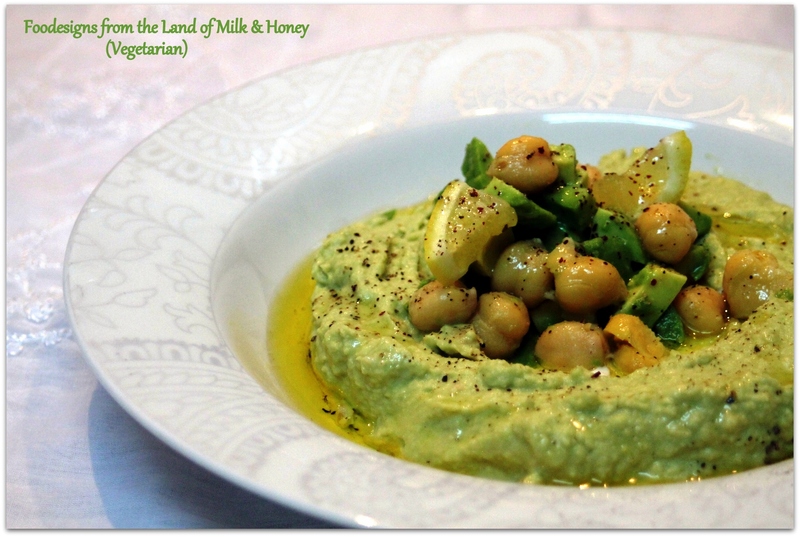 Serve with Avocado cubes, cooked chickpeas, chopped lemon and lots of extra virgin olive oil ! This entry was posted in Hummus - and more..., Middle Eastern Food and tagged avocado, hummus, Middle-Eastern food, tahini. Bookmark the permalink. Mmm, that sounds so delicious! No matter how you blend it, you can’t go wrong with hummus. This looks amazing. So colorful and creative, Michal. Thank you, Shanna. One of my FB readers suggested it (“how about hummus with avocado”) so I tried it and loved it. Well you’ve just combined two of my favorite foods! Amy, if you squeeze fresh lemon juice on it – it won’t turn brown but I do suggest eating it the same day you make it.